I have a mission to inform the public about insects and to help people get past the myths and their squeamishness about insects so that they can appreciate how important and fascinating they are. An Aberdeen-based scientist with a mission to spread the word about wood ants has won a prestigious new award from the Royal Entomological Society. Jenni Stockan of the James Hutton Institute's Ecological Sciences group won the inaugural Marsh Award for an Early Career Entomologist who has had an outstanding impact on the science. Her research work at the Institute together with her dedication to communicating her passion for the subject and engaging with the public impressed the judges. Jenni has worked at the James Hutton Institute for the past 10 years and will complete her PhD on riparian buffer strips next year. These strips of land between agriculture or forestry and water are integral to the Water Framework Directive and are designed to improve water quality but are also perceived as providing a refuge for wildlife or enhancing existing biodiversity. However Jenni’s research has shown that not all wildlife benefit from the strips. 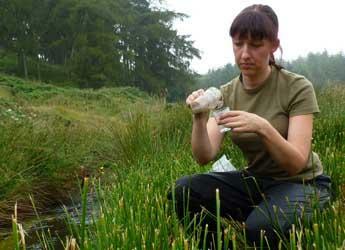 Her work is largely based in the north east of Scotland and in 2010 she founded the Aberdeen Entomological Club. She is also vice-chair of the UK Wood Ant Steering Group, Honorary Scottish Secretary for the Royal Entomological Society and is editing and contributing to a book on the ecology and conservation of wood ants for Cambridge University Press. She regularly gives talks to gardening groups, students and the general public and encourages everyone to become more involved with insects. She explained: “I have a mission to inform the public about insects and to help people get past the myths and their squeamishness about insects so that they can appreciate how important and fascinating they are. One of the toughest challenges Jenni has faced was convincing her own mother of the charm of insects. Linda Johnstone was not as enamoured of ants and beetles as her daughter. Jenni said: “The crucial thing was telling her it requires insects in order to produce chocolate. That finally won her over." Jenni was presented with her award by Professor Jeremy Thomas (President of the Royal Entomological Society) and Brian Marsh OBE (Chairman of the Marsh Christian Trust) at a recent meeting of the Royal Entomological Society. The Marsh Christian Trust was established in 1981 and has two main areas of work; grant-making and the Marsh Awards. The Trust runs a portfolio of Awards with a number of internationally and nationally recognised organisations to recognise unsung heroes who all aim to improve the world we live in.